A Magazine Curated By is a unique magazine concept that explores the universe of a different fashion designer invited as the ‘guest curator’ of each issue. We invite a guest curator – an international fashion designer, group or house – to develop innovative, personalised content to express their aesthetic and cultural values. Each issue celebrates this designer’s ethos: their people, their passion, their stories, emotions, fascinations, spontaneity and authenticity. Conceived as Belgium’s first fashion magazine, A Magazine Curated By has gained international acclaim for its intimate perspective into the minds of the most inspiring fashion designers working today. 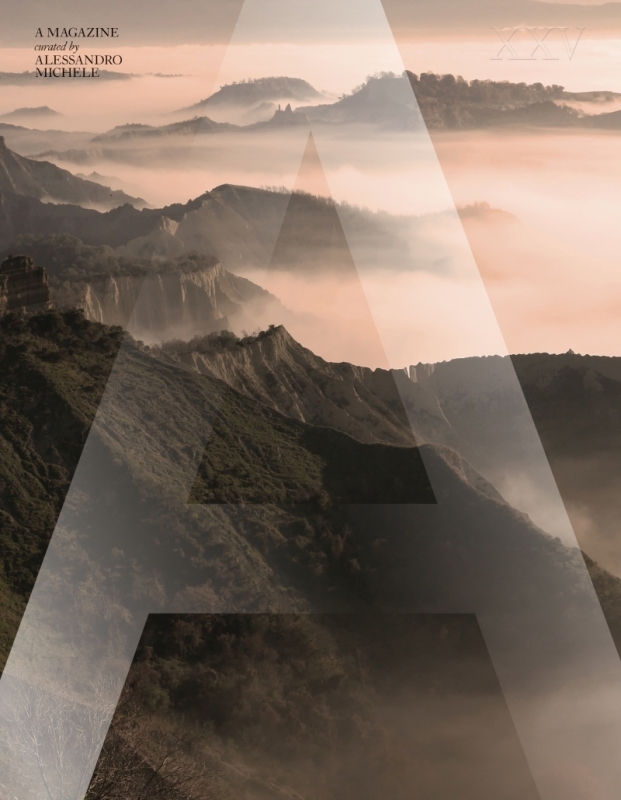 Every A Magazine Curated By is a new story waiting to be told. A Magazine Curated By is delighted to announce that the 18th issue has been curated by the London-based fashion designer Simone Rocha. 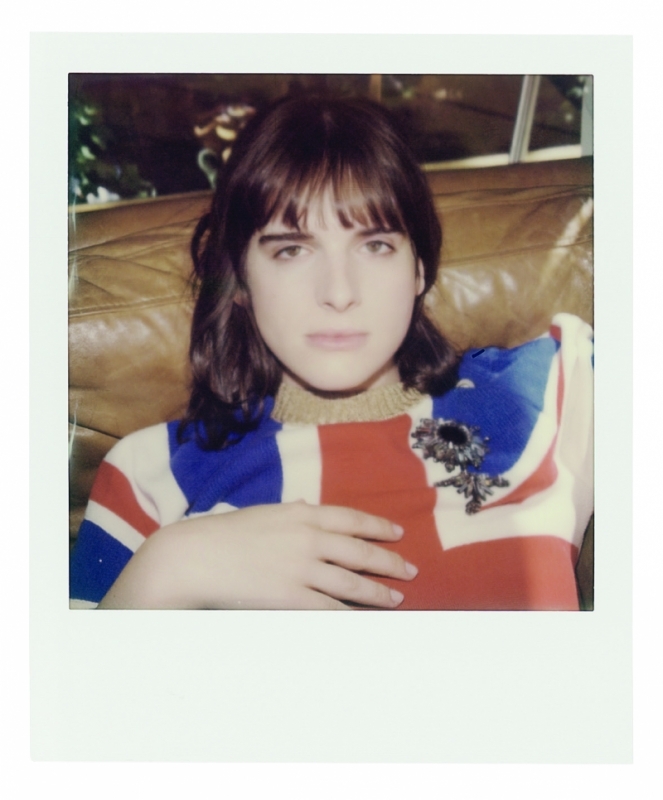 Simone’s sensitive, intellectual approach to fashion is marked by an intimate, unfiltered vision of contemporary femininity with all its twists and turns, a fact that imbues her collections with a unique (yet inclusive) point of view. Simone has called upon an international cast of friends, family, and creative collaborators whose regard stretches above and beyond her chosen subject matter to paint a broad picture of our postmodern human condition – celebrating nostalgia whilst remaining firmly rooted in the present. In a determined effort to cross-pollinate Simone’s disparate cultures within the pages of the magazine, a diverse cast of contributors emerges. Ben Toms, Broomberg & Chanarin, Chimamanda Ngozie Adichie, Colin Dodgson, Donal Ryan, Dorothy Cross, Eoin McLoughlin, Feng Li, Jacob Lillis, Jamie Hawksworth, Jenny Holzer, Leslie Zhang, Linda Brownlee, Lou Stoppard, Louise Bourgeois, Malina Joseph Gilchrist, Mary Robinson, Max Rocha, Niall O'Brien, Odette Rocha, Perry Ogden, Petra Collins, Ren Ri, Richard Mosse, Robbie Spencer, Roni Horn, Ruth Rogers, Sam Rock, Sarah Moon, Seamus Heaney, Stephanie Hegarty, Thurstan Redding, Tyler Mitchell. A Magazine Curated By Simone RochaThe product (Reference ) is not presently in stock. This 17th edition of A Magazine Curated By is a comprehensive immersion into the artistic universe of Eckhaus Latta anchored by the core conceptual twist of parody – satirizing the tropes of a fashion magazine and in particular the longstanding tradition of a ‘September issue’. Eckhaus Latta’s avant-garde approach to fashion is brought to light through its adoption and subsequent subversion of existing structures, whilst acknowledging the label’s place in America’s contemporary art scene today. Across two hundred pages, Eckhaus Latta have enlisted a multitude of talents to approach their own work and the fashion industry through both scrutiny and celebration. Contributors include: Anders Edstrom, Anicka Yi, Camille Bidault-Waddington, Chris Kraus, Haley Wollens, Michael Bailey-Gates, Roberta Smith, Roe Ethridge, Sharif Hamza, Susan Cianciolo, Zoe Ghertner and many more. A Magazine Curated By Eckhaus LattaThe product (Reference ) is not presently in stock. A Magazine Curated By is delighted to announce that the 16th edition of A Magazine Curated By has been guest edited by Gucci’s Creative Director Alessandro Michele, for a worldwide release in November 2016. This landmark issue of A Magazine unfolds over 280 pages of exclusive content developed by Alessandro Michele, preserving the ‘carte blanche’ free-reign concept devised by Walter Van Beirendonck in 2001. An unprecedented cast of international contributors were invited to express their creative perspective on a theme dear to Michele’s heart; each were offered the words ‘blind for love’ as the starting point for over forty distinct narratives that unfold throughout. A Magazine Curated By Alessandro MicheleThe product (Reference ) is not presently in stock. A Magazine Curated By is delighted to announce that American designer Thom Browne has curated the Spring Summer 2016 issue for a worldwide release this March. Following Rodarte and Proenza Schouler, Browne is the third American designer to take part in the A Magazine project, which offers carte blanche to a fashion designer to open their universe across 200 pages of creative content. He is the first menswear designer to curate A Magazine since Riccardo Tisci in 2008. Browne has tipped a both prestigious and personal cast of contributors for the issue, calling on members of staff, his partner and close friends to collaborate as well as a host of international artists and personalities including Baz Luhrmann, Martha Stewart, Rick Owens, and Hans Ulrich Obrist. A Magazine Curated By Thom BrowneThe product (Reference ) is not presently in stock. This landmark issue represents the first A Magazine curated by an Italian woman and the first to explore the decorative realm of a jewellery designer, after the magazine’s longstanding relationship with prét-à-porter designers was first diverted in 2013 by the curation of British milliner Stephen Jones. Delfina has chosen the abstract theme of ‘gold’, tipping an international array of artists, designers, photographers, stylists, architects, philosophers and other creative minds to interpret a myriad of aesthetic, alchemical and metaphysical representations of this precious metal and its intrinsic energy. Rafael de Cardenas, Patrick Kinmonth, Luca Guadagnino, Robbie Spencer, Matthew Stone, Katie Shillingford, Shala Monroque, Stanislas Klossowski de Rola, Nico Vascellari, Marc Quinn, Olafur Eliasson & many more. A Magazine Curated By Delfina DelettrezThe product (Reference ) is not presently in stock. Contributors include: Alexander Fury, Alexia Niedzielski, Amanda Harlech, Benjamin Millepied, Carlos Van Camp, Caroline Farneman, Casey Legler, Daphne Guinness, David Altmejd, Elizabeth Von Guttman, Erik Madigan Heck, Geoffrey Lillemon, Hanne Gaby Odiele, Harold Koda, Jean-Baptiste Mondino, Jerry Stafford, Jina Khayyer, Karl Lagerfeld, Kris Kuksi, Loïc Prigent, Martin Hanczyc, Max Cooper, Melinda Williams, Michael Hansmeyer, Neri Oxman, Nicolas Ouchenir, Nick Knight, Pierre Debusschere, Phillip Beesley, Philippe Pourhashemi, Remedios Varo, Reto Schmid, Robbie Spencer, Rosa Verloop, Salvador Breed, Saskia de Brauw, Thibaut Wychowanok, Tilda Swinton, Vincent Van De Wijngaard, Yousef Al-Medari. A Magazine Issue 13The product (Reference ) is not presently in stock. Inviting generations of British and continental talent to express his universe not only through their eyes but through their hands, the British milliner Stephen Jones has dedicated his issue of A Magazine Curated By to Anna Piaggi and the art of illustration. Stephen’s issue delves into the worlds of drawing and design in a kaleidoscopic oeuvre filled with archival and newly commissioned works from artists and designers, students, teachers, curators, performers, academics, a tattooist and a manicurist – all of whom are first and foremost his very good friends. From a titillating centerfold with Dita Von Teese by David Downton to Nick Knight’s floral christmas cards and the industrial designs of Zaha Hadid, Raf Simons or Ron Arad, A#12 approaches illustration from many perspectives. You will find the process sketches of designers from Marc Jacobs to Thierry Mugler alongside student works and the musings of fashion curators Olivier Saillard and Valerie Steele, as well as works from the crème de la crème of fashion illustration from Gladys Perint Palmer to Howard Tangye, Barbara Hulanicki and Tony Viramontes. A Magazine Curated By Stephen Jones invites you to look through the page and down the rabbit hole with the mad hatter – in an elegant whirl of colour, line, creativity and humour. A Magazine Issue 12The product (Reference ) is not presently in stock. Californian designers Kate & Laura Mulleavy of Rodarte weave a vibrant tapestry of natural and built environments, featuring inspiring landscapes and the characters that inhabit those worlds – with artistic contributions from contemporary talents such as Jay DeFeo, John Baldessari and Joss Whedon. Highlights of A#11 include two exclusively commissioned portfolios, featuring Kirsten Dunst in the Rodarte Autumn | Winter 2011 collection photographed by David Armstrong, and Elle Fanning in the Rodarte Spring Summer 2012 Couture collection photographed by Bill Owens. A Magazine Issue 11The product (Reference ) is not presently in stock. Italian designer Giambattista Valli proposes A#10 as an essay on the topic “what is beauty?” with contributions from many contemporary artists, photographers and influential style icons including Louise Bourgeois, Nan Goldin, Chiara Clemente, Lucio Fontana, David Hicks, Richard Avedon, Slim Aarons, Iman and the late Corinne Day. Join Valli on his inspiring journey through a raw underworld of beauty, juxtaposed by a glamorous and decadent bygone era. A Magazine Issue 10The product (Reference ) is not presently in stock. What is so special, and so unexpected, is that Lazaro Hernandez and Jack McCollough have chosen to take their American-ness, this national designation, as an asset, a resource, something that does not dictate their identity as designers but instead enhances it. Like the land artists they so admire, they are looking at their country with resourceful, refined eyes. And they know that fashion is, of course, an incursion onto a landscape, sometimes transient, sometimes permanent, and that the mere truth of that carries with it enormous responsibility and glorious opportunity. Read on. A Magazine Issue 9The product (Reference ) is not presently in stock. Graduated in 1995 from the renowned fashion department of the Antwerp Academy, Veronique Branquinho presents collections under her own name in Paris since 1997. Today, besides a women’s collection, her label also includes a men’s collection, and a shoe collection. In the late 1990s, Veronique Branquinho took the international scene by storm with a very personal take on femininity and elegance, her signature strongly influenced by the complexity of the female character. Underpinned by subtle references to film, music and art, her fashion offers an alternative to the big luxury brands. Her collections are favoured by men and women who appreciate high quality clothes with a traditional finishing, in superior fabrics. The theme of female duality, the transition from girl to woman, the ambiguous mystery of the awakening eroticism, takes centre stage in Veronique Branquinho’s oeuvre. Her work is dominated by the perpetual movement between attracting and rejecting, revealing and concealing… For A MAGAZINE, Veronique Branquinho will create a ‘warm, personal and masculine’ issue, a precious and elegant edition offering a unique view on her world and her work, her passions and sources of inspiration. A Magazine Issue 6The product (Reference ) is not presently in stock. N°5, a mythical number in the fashion world if ever there was one. For our very own #5, we have invited our first female guest curator: Martine Sitbon. From its very cover it radiates a woman’s point of view, the choice to be both seductive and witty. Martine is the perfect mix of Lewis Carroll’s fantasy and Blondie’s energy, and that is exactly what we have tried to bring to this issue. A Magazine Issue 5The product (Reference ) is not presently in stock. A Magazine Issue 4The product (Reference ) is not presently in stock. Words are very important to Yohji Yamamoto. Not the endless flood of words used to fill silences, but only those words that seek out the silence, that go for depth, ask questions, listen, look, confirm, words that give warmth, words that sing. Similarly, every new magazine in our series starts with a conversation. Words that capture the essence of that conversation are used to sketch the rough outlines of the concept. These words are written onto a white sheet. Every time we start with a blank page. Every magazine is a new story. And so this has become a magazine of many words. About friendships, about collaborations, about admiration. Conversations with 20th century icons and the young turks of today. Words of and about “soulmates”, who share the same fascinations, strive for the same quality, travel the same roads, seek the same silences. Yohji Yamamoto. In our eyes he is one of last century’s most innovative designers. He has completely changed our vision on fashion. He has enchanted us and forever initiated us in a new beauty – the beauty that comes from within and that bears no relation to what we previously knew. A Magazine Issue 2The product (Reference ) is not presently in stock. A MAGAZINE is the new name of the Belgian fashion magazine whose title previously played with the letters of the alphabet. Insiders, we know, cherish the issues “curated” by fashion designers Dirk Van Saene (N°A), Bernhard Willhelm (N°B), Hussein Chalayan (N°C) and Olivier Theyskens (N°D). 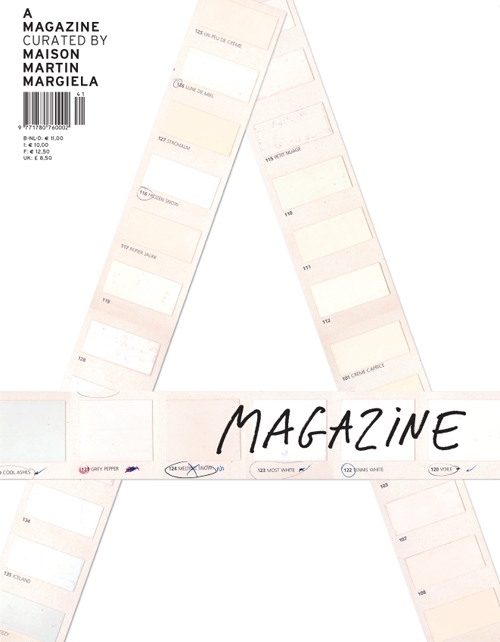 This issue will undoubtedly become a collector’s item as well since our guest curator is Maison Martin Margiela. Each issue is a new adventure. Because our guests “design” their own magazine, it is “invented/reinvented” over and over again. With Maison Martin Margiela this adventure brought us into contact with everybody that has ever had ties with the house, long or short. Permanent staff members, casual collaborators, trainees, assistants, models, artists, photographers, musicians, choreographers, filmmakers: some of them are still closely connected to the house, others have since gone their own way. Maison Martin Margiela and the “extended creative life and expression of the house” became the leitmotiv. Therefore this magazine is like a reunion, where all of these people were invited tobe present within its pages, to show what they are working on at the moment or a piece of work which still remains very dear to them. Since its very beginnings the Maison has worked with white, in all its shades and temperatures, as a unifying signature. A trace of these whites, in their many expressions, overt and hidden, runs as a thread between the participations. “The past is what bonds us – The future leads us” became the dress code for this reunion. You are more than welcome to share this moment of creative expression with Maison Martin Margiela in A MAGAZINE! A Magazine Issue 1The product (Reference ) is not presently in stock. 2 issues subscriptionThe product (Reference ) is not presently in stock.